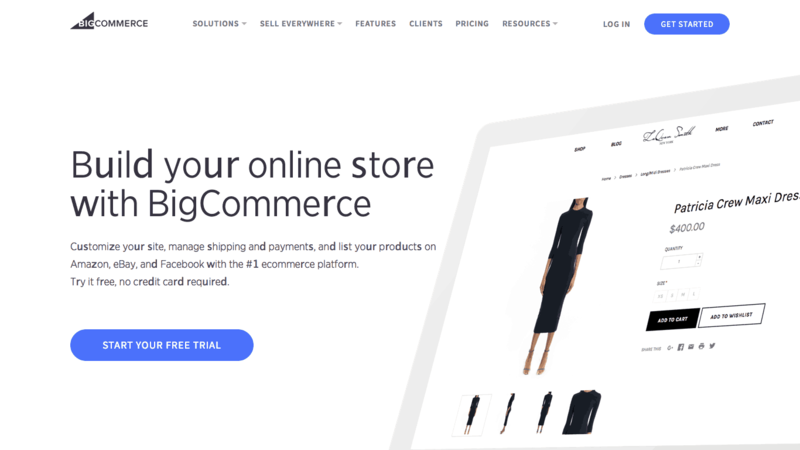 BigCommerce Review: Is A BigCommerce Store Right For You? BigCommerce is one of the most popular ecommerce platforms on the market today, and with good reason. They’ve processed more than $9 billion in online transactions, and power tens of thousands of stores. There are a number of integrations and new features that make it an ideal choice for many ecommerce business models. It certainly has its pros, but it’s not the right choice for every store. Let’s take a closer look at what you can expect from it, so you can decide if it’s right for your online store. High volume stores pay more. 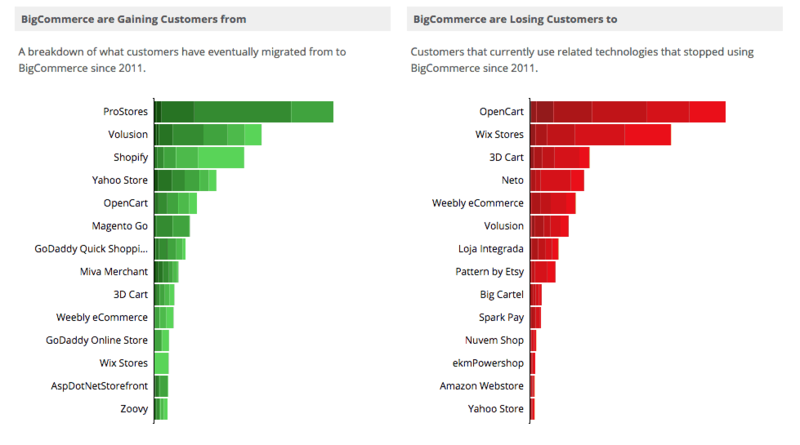 How Does BigCommerce Compare To Other Ecommerce SaaS Platforms? I’ve given it the best overall rating, because it has several advantages over other platforms, such as an unlimited number of products, no transaction fees, a wide array of features, and a decent mobile speed store. It falls a bit flat in terms of load time, which can frustrate shoppers. Inconsistent speeds. When I tested BigCommerce some sites didn’t load or had really long load times, slowing down the otherwise fast average. I’m not the only one. There’s strong SEO performance. Everything’s served from a content delivery network to speed up delivery. And, you have complete control over SEO data for each of your products, including the page title, meta keywords, meta description, and product URL all from within the product area. Multi-channel selling is made easy. Manage your Amazon, Facebook, eBay, and Pinterest stores all from within BigCommerce. Your inventory will sync across all channels so you don’t oversell. Sell the last of something on Facebook? It’ll go out of stock everywhere until you update your inventory. 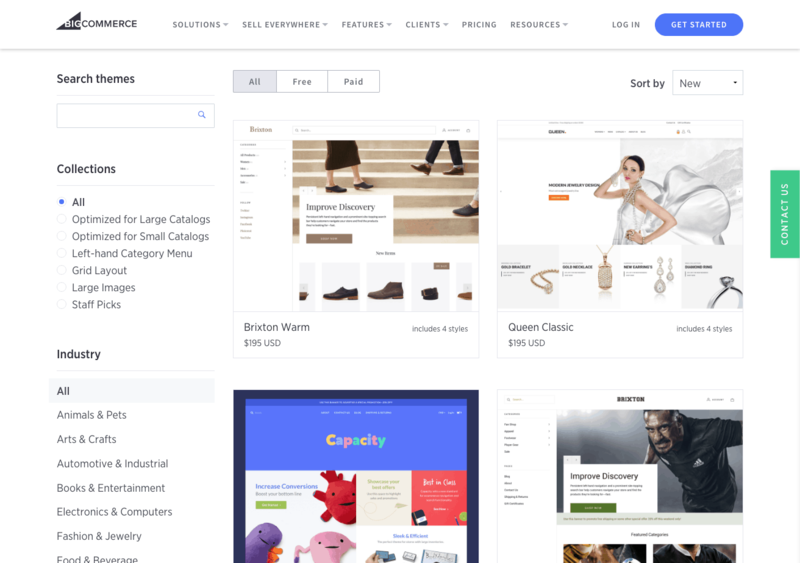 BigCommerce’s themes are stunning. The theme designs are of stellar quality, but there aren’t many free ones to choose from. At the time of this writing, there are only seven free themes in the BigCommerce theme store, across all industries. One of the major advantages to BigCommerce compared to other ecommerce platforms is the lack of transaction fees. When you consider that the some of the competition has transaction fees in addition to the monthly service subscription fee, this makes BigCommerce one of the more affordable options. Remember though, if you have transaction fees through your payment processors, like PayPal, Stripe, and Square, you’ll still be responsible for those. When major brands like these trust their stores to a platform, you know they’ve got good reason. BigCommerce offers a fully functional online store, with the ability to sell an unlimited number of products. You’ll have unlimited bandwidth and file storage, gift cards, a rating and reviews functionality, and professional reporting, even in the basic plan. Shopify and Volusion offer cheaper starter plans, but require you to opt into a more expensive plan to get the similar feature set. 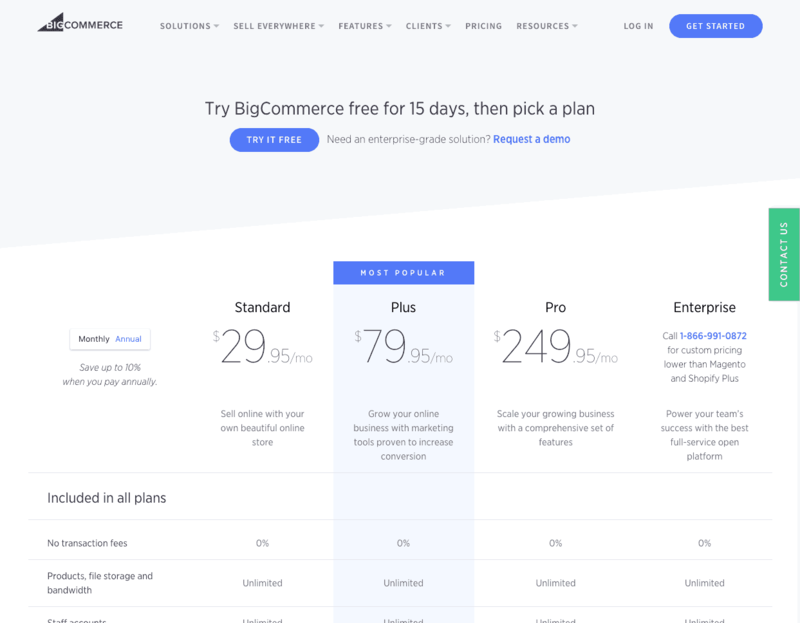 BigCommerce has three pricing plans to choose from, ranging from $29 to $249 a month. All plans include basic SEO tools, product search, coupons, Amazon (FBA) integration, drop shipping, and real-time shipping/tracking. You’ll also get a 10% discount if you opt for the annual plan instead of paying monthly. If you want to be able to send your customers abandoned cart emails, you’ll need to be on the standard or pro plan. If you want to be a Google Trusted Store, you’ll have to subscribe to the pro plan. It’s worth noting, if you plan on selling more than $50,000 a year, you’ll have to upgrade to bypass that limit on the basic plan. If you sell more than $150,000 a year, you’ll need to upgrade to the pro plan. The pro plan starts at $249.95 a month if your store brings in up to $400,000 a month. If you surpass that threshold, you’ll pay at least another $150 per month for each additional $200,000 in sales. Those expenses will add up. And, if you need any kind of subscription or recurring billing services, you’ll have to pay for an add-on. Want to reward your customers with a loyalty program? You’ll have to pay more for an add-on. Want to make up-selling and cross-selling easier? Yep. You guessed it, another paid add-on. If these are features you must have in your ecommerce SaaS platform, you may find one of the BigCommerce alternatives more cost-effective. If you find yourself outgrowing the standard and pro plans, you always have the option to contact BigCommerce about an enterprise plan with custom pricing with additional features. However, you may find that it’s not the right choice for your company. Selling online with BigCommerce is easy, but it doesn’t come without challenges and hiccups. I love the fact that you can use BigCommerce to handle multiple sales channels. When you’re starting from scratch, you can leverage the popularity of Amazon, eBay, Google Shopping, and other platforms to get your products and services in front of customers. Having a central point to manage of that makes it easier to streamline operations, saving you time and money. It also integrates with PayPal, Square, Stripe, AmazonPay, and a number of other popular payment gateways. It’s also possible to take your business global since it supports multiple currencies. You’ll find it easy to market to new and existing customers since it integrates with many email marketing services, including Mailchimp, Infusionsoft, and Constant Contact. There’s a huge flaw when it comes to cross-selling and up-selling apps. It’s something you have to pay extra for no matter which plan you choose. There are a couple options in the app marketplace – such as Unlimited Upsell – Buy X Get Y, with plans ranging from Free to $59.95 a month, or Boost Sales | Upsell & Cross-Sell Popups by Beeketing for $50/month after a 15-day free trial. The BigCommerce Theme Store lets you see what you could work with if you choose to use the platform. It’s a good store that gives you a selection of free and paid options. You’ll be able to find a stylish responsive theme that’s easy to work with. However, since most of the themes come from a single developer, there’s not much in terms of uniqueness from theme to theme. Expect to pay $150-$200 for a decent theme. BigCommerce has no shortage of apps in their marketplace, and many of them are free. But, don’t let the “free” price tag fool you, as many integrations may be free to install, but require paid subscriptions to the services you’re using. Take for instance, the addition of a loyalty program. It’s free to add the integration to your BigCommerce store, but it won’t work unless you’re paying the app’s monthly service fee. That will set you back anywhere from $59 to $599/month, for 2,000 to 25,000 members. That doesn’t sound like a bad deal, really, but when you consider you’ll have other needs that require paid subscriptions, you could find yourself spending thousands more a month to build a store with features you need. There are plenty of marketing apps to include to help you with everything from email marketing to conversion rate optimization and even creating your own affiliate program. If you plan on using dropshipping, you’ll have to use a third-party app for this. There are six to choose from, and they will cost you anywhere from $10 to $50 a month to use. After pricing, the ease of use is the most important factor for many startups. BigCommerce comes with a website builder that allows you to build responsive designs with relative ease. There are tutorials to help you get through the process, as well. BigCommerce now uses the Stencil framework, which is friendly for advanced developers – making it a good choice for companies that can afford to hire a developer. But, for the startup on a tight budget without a technical background, it can be hard to make small changes. 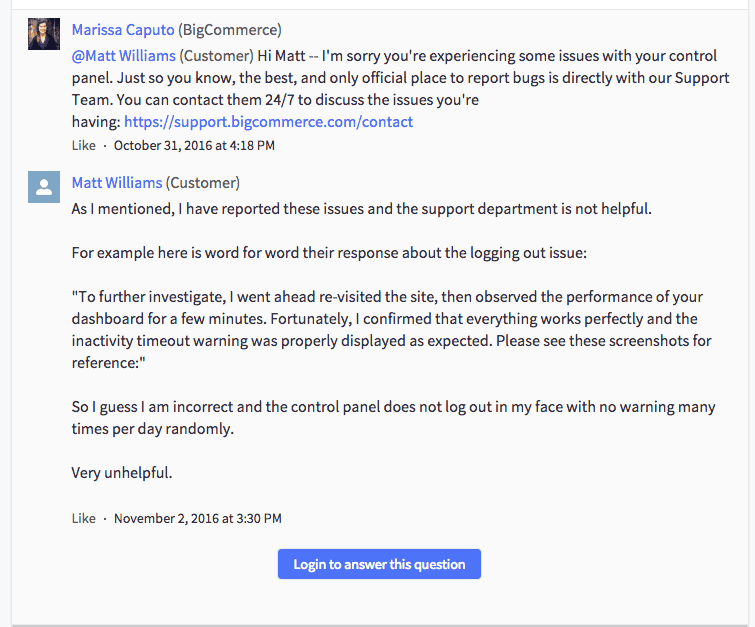 When it comes to other platforms like Shopify and Volusion, BigCommerce definitely has them beat in terms of customer service. On the customer support page you’ll find tons of resources to help you – from online forums to a knowledge base. You’ll get videos and tutorials, too. When you need help, you can reach them by phone, live chat, email, and the forum. However, some readers have said the live chat and phone options aren’t as helpful as you might expect. Though the live chat team is available 24/7, they can get backed up, leading to long wait times. If you’re totally new to selling products online, definitely take the time to check out BigCommerce University. There you’ll find a series of informative videos to help your site earn more money. It’s easy for you to setup product options and rules. You can sell both physical and digital products. Manage and process your orders, and keep an eye on your entire inventory at a glance. Even those who don’t have a strong tech background can make BigCommerce work with little effort. In terms of hosted solutions, the main competitor for BigCommerce is Shopify. It’s in a similar price range, and offers similar features. Here’s our Shopify review. Other than Shopify, 3dcart offers much of what you’ll find with BigCommerce. You’ll get a similar pricing structure and features, without transaction fees, and a fast load time. Overall, BigCommerce does a great job of addressing what people need in online store software. No company is perfect, so while there is definite room for improvement in some areas, BigCommerce sets the bar in many others. It’s a good choice for people who want to start an ecommerce store, or who have a brick and mortar store and want to expand their operations to include online orders. The available tools make it possible for any niche or industry to be successful. Since there’s a store builder and all the technical aspects of server management and security are handled for you, you can focus your time and effort on other areas of your business such as customer relationship management, marketing, and product development. If you’re interested in seeing if it could work for your business, there is a 15-day free trial available for new accounts.